We love to serve this squash dish to people who claim they hate squash. Why? 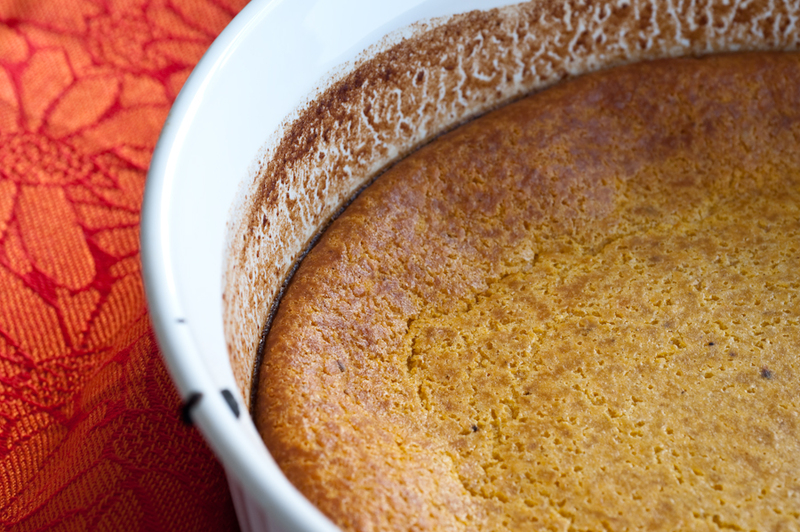 Because inevitably, that person says, “Oh my gosh, this tastes like pumpkin pie! How did you make it?” And then we get to gloat. Also, it’s kosher for Passover. If you celebrate Passover, you understand how hard it can be to find tasty recipes. This one will become a staple in your holiday recipe book and throughout the year. In a pan, cook one 12-oz. pkg. frozen yellow squash, slightly thawed and one 8-oz. stick of butter for about 15 minutes until melted. Add ½ c. sugar with a wire whisk. In a 2 qt. casserole dish, combine the squash/butter mix with ½ c. matzo meal, 3 eggs, 2 c. milk, and a pinch of nutmeg and pinch of cinnamon (or a couple of pinches of pumpkin pie spice). Bake for 1 hour or more at 350 degrees until the top is brown and the soufflé is solid. If you tap the outside of the dish with a spoon and the contents no longer “jiggle,” it’s ready to eat. Check out the photo as a guide. This soufflé took 1 ¾ cups milk and nearly 1 ½ hours to cook, so your oven will vary the cooking time. Serves about 8 people. Not only is squash a healthy choice for this sweet Passover dish (providing fiber, Vitamin C, and potassium), but it also serves as a reminder that frozen vegetables are just as beneficial as fresh. Unfortunately, frozen produce tends to get passed over in favor of fresh, but the advantage to having longer lasting, always on hand, nutrient-rich fruits and veggies is huge. And who hasn’t tossed out once-beautiful fresh produce because it was forgotten until it started to spoil? Particularly in these penny pinching days, strive to use food dollars wisely and include more frozen fruits and vegetables. How Stacey Got the Shot: ISO 100, 60mm focal length, f/10, ½ second exposure. You can substitue Rich’s non-dairy creamer for the milk and the dish becomes parve! Great recipe.